2) Ellie's new decision that my name is Mama Kitty and she is "Baby Kitty. NOT Ellie Kitty. And NOT Baby Ellie Kitty. JUST Baby Kitty." Love that when she came home yesterday she said to me as I walked into the house from the studio, "Mama Kitty get over here!" There is magic in the air in the midst of the intensity of every day with a toddler. And that magic side by side with the chaos is where I find the joy waiting for me again and again. 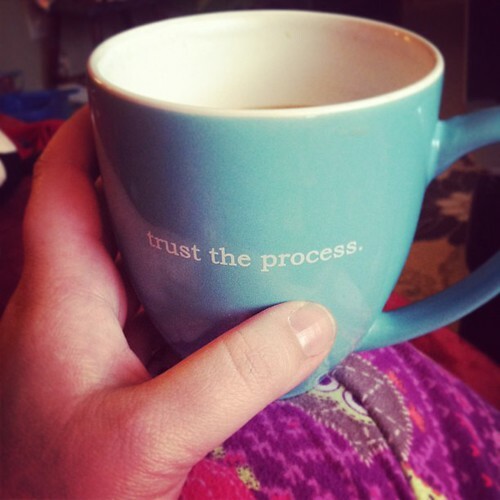 3) The truth on this mug is holding my hand on the days I need this reminder to just trust how it all is unfolding around me (mug from The Universe Knows). 4) I've mentioned Anna Wingfield's shop before, but I just have to tell you about two more of her products that I've been using lately because I'm just so happy to have found a "go-to" natural essences shop with products made by someone who puts so much heart into her work. I go through cycles of not sleeping well (this is NOT the good thing) and in December I had a series of nights where I kept having some really bad dreams. It was pretty intense. For the last couple of weeks I've been using Anna's Angel Whispers Sleeping Potion. I spray it on my pillow before I lay down each night (it has this lovely lavender smell). And I've been sleeping better. No bad dreams. Yesterday, I had a horrible "going to bed now is the only choice" headache, and used the Migraine Relief I had actually purchased for Jon to use for his migraines. Breathing in the mint + eucalyptus smell calmed me and took a big bite out of that intense pain. And I've also been using the Trust Yourself roll-on perfume because the name is, well, perfect and it smells so darn good. As you can tell, I highly recommend Anna's products. 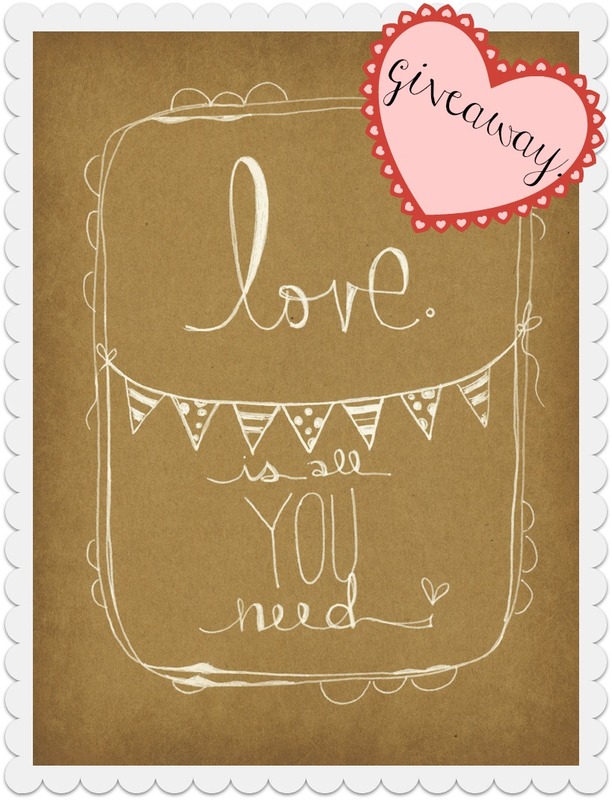 5) I am totally in awe of the Your Story Retreat selling out in less than 24 hours. Wow. (Thank you!) Dreaming up a fall retreat on the Oregon Coast in the same place. Yes. We still have spots available for the Feast Retreat this April. It is going to be so lovely and intimate. 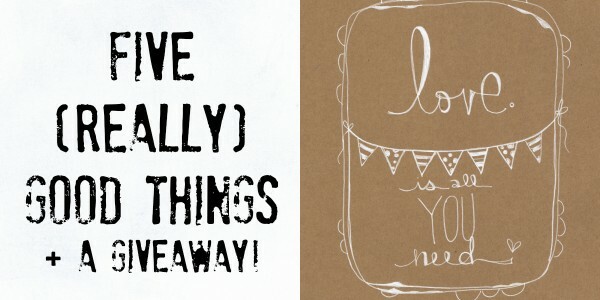 Artist Kelly Barton is giving away one of her "love is all you need" Moleskine journals today! Yours will be hand illustrated just for you and will look like the one pictured here (and in her Etsy shop). Just leave a comment below in this post (and be sure to include your email address with your comment so that I can contact you if you win). The giveaway will be open through 9PM PST on Sunday, and I will announce the randomly selected giveaway winner here in this spot on Monday. Please enter only once. Thanks! Be sure to visit Kelly's shop! Giveaway Winner: Comment #23 was chosen randomly. Congratulations to Meghan! Look in your inbox for an email!